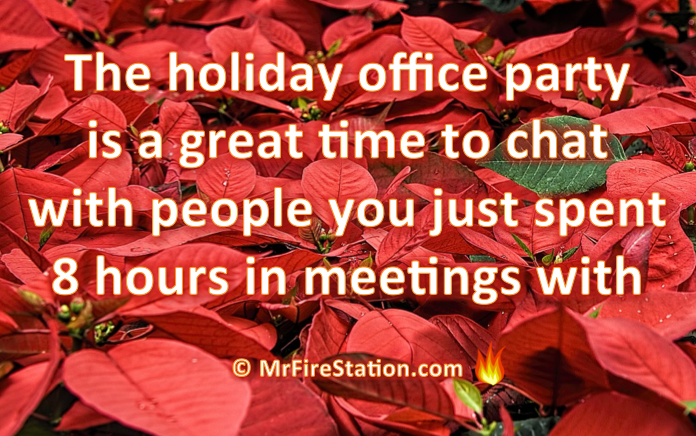 How does your office holiday party stack up? Does your company do it up big, or is senior management preaching belt tightening and concerned about the optics. I have to say that my last MegaCorp’s office party was a bit of an embarrassment. In last year’s post on this topic, I compared our year end holiday employee event with data from a study of holiday office parties across the country. While no one needs to do it up like Mad Men, I think the holiday office party is a is a real opportunity for the boss to send off employees at the end of the year with genuine gratitude and respect for the work they do. Last year, I hosted more than 50 employees from my team for a holiday party at my house one December Friday afternoon (at my expense). Catered trays, shrimp, and alcohol – along with an ugly holiday sweater contest. Good fun. Well worth the expense. Hard to believe that I could afford to treat my team more easily than a company with tens of billions in sales each year, but I guess we have different priorities. Tonight we had a terrific Holiday social at one of the non-profits for which I serve on the Board. It was a very elegant affair in a downtown high rise with wine & hors douvres. The cost was covered by one of the Board Trustees, who like me last year, enjoyed doing it as much as others enjoyed attending. I think the connections and conversations that happen at these kinds of events are hugely valuable and pay dividends throughout the year. What does your organization do for s holiday office party? Yes – Like you, I am not a fan of parties that take place outside of work hours. There is no reason for that at most offices. My office party is very simple since I’m a one man show!